I recently had a bad experince with online store Daisy Street. This happened nearly a month ago now and i have only just decided to post about it on my blog, its a scary thing posting a bad review but I just wanted to warn you all to what happened to me. Luckily I'm happy to be annoying and persist to get my money back but im quite sure that if I didn't, I'd still be £23 down. 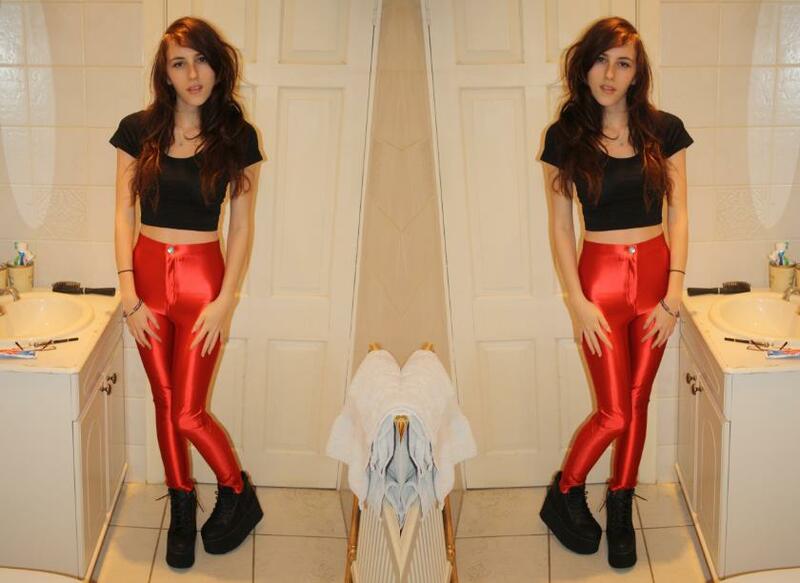 Disco pants are all the rage right now, I had black and now i wanted red! I know AA do them but I didn't have £70 spare so I searched online for them everywhere and was super excited when I came across them on Daisy Street. Normally I wouldn't order from websites that aren't too well known but I'd seen a few bloggers talk about it before and I thought it should be fine. Well I was wrong. I just wanted to warn you guys in case you were thinking about ordering from them. I recieved my disco pants fine, i tried them on & took a quick snap (as bloggers do) but they weren't right, they were baggy for a size 8 and a different red than advertised on the site (check out the photo) and I didn't like it. That was fine, I'll just send them back and get a refund right? I took my package to the post office on 25th Jan and paid extra to get recorded devilery. Good job I did because my package got lost on the post, I don't know. Heres how it went. I contacted them to say that I hadn't yet received my refund nearly 2 weeks later. They said that's not right and asked for my recorded delivery bar code so I gave it to them. I'm thinking that oncve they'd realised that they actually had to give me a refund and never replied. that was on the 11 Feb.
£3 less than I was expecting but I wasn't too bothered. At this point it was more about principle than the money. They also gave me an £5 voucher probably hoping that I wouldnt do this. Im Still not 100% that posting this is a good idea but I'm going to do it. I hope it was worth writing up and hopefully will make you think twice when ordering from a website that your just not sure about. Thank you for the kind comment on my blog I need to take your advice . And eat myself an Easter egg. I need sine tlc. Fantastic post- you go girl! -I'm having problems with a few companies to and after I actually receive my items I'm following suit! I'm nit afraid of backlash either. Thats horrendous them not addressing the situation.. its LAW for website sellers to give you a refund no matter what the situation whether they are faulty or not (Distance Selling Act etc etc)! I'm glad you posted this because I've seen a few bloggers working with them (thinking that they are a decent brand!) but they really do need to buckle up their ideas on this! Ahh I am glad I'm not alone I have had such bad service from Daisy Street, I love my disco pants but I will never shop with them again on principle of their awful customer service! !